NEW ORLEANS – NCAA Division I’s indoor track & field regular season is in the books, with the men’s and women’s National Team Computer Rankings telling the tale of two different national title chases that could go down March 13-14 in Fayetteville, Arkansas. Though the No. 1 Florida men took home the SEC team title in a rout, the rankings released by the U.S. Track & Field and Cross Country Coaches Association (USTFCCCA) on Monday show that the Gators will have their hands full with defending national champion No. 2 Oregon. The Ducks bolstered their already stout distance corps for NCAAs en route to winning the MPSF title. Meanwhile, Arkansas’ No. 1 women were even more impressive in winning the SEC Championships, beating No. 2 Florida by 44 points for the title – the biggest margin of victory since the Razorbacks topped the Gators by that same margin in 2000. The Gators managed to make up the slightest bit of ground on the Razorbacks in the rankings thanks to some outstanding individual performances, but Arkansas remained the clear favorite over both Florida and No. 3 Georgia. For more detailed breakdowns of the men’s and women’s rankings, keep reading below. The chases for the men’s & women’s national titles will take one more pre-meet twist and turn next week, when the final National Team Computer Rankings are released taking into account only athletes entered into the championships. 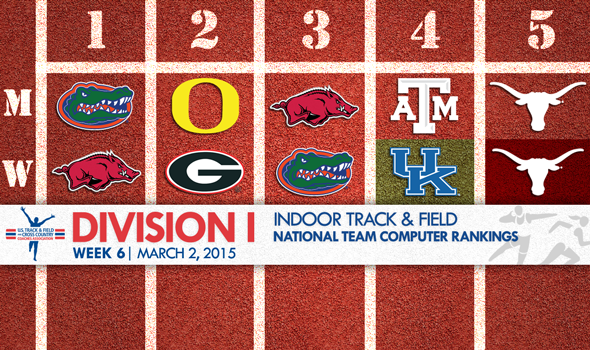 Declarations for the NCAA Championships will be published Tuesday evening. Note that while Florida’s and Arkansas’ national ranks reflected their conference championships performances, the National Team Computer Rankings are not designed to predict how teams would fare against one another in a smaller conference championship setting. Rather, the formula calculates which teams have the best opportunity to win the NCAA Championships in which far more teams are represented. For a full breakdown of the process, click here. Remaining steadfast atop the women’s national team rankings were No. 1 Arkansas (186.11 team points), No. 2 Georgia (155.77) and No. 3 Florida (145.73). Each of the three got big season-best performances that moved the needle at the top of individual national event rankings – No. 2 Chrishuna Williams at 800 meters for Arkansas, No. 3 Tatiana Gusin in the high jump for Georgia and No. 10 Claudia Francis at 800 meters for Florida – all three’s team scores dipped ever so slightly. Why was that? Because No. 4 Kentucky (129.84) – also from the SEC, giving the conference each of the top four teams in the nation – gained nearly 50 points to jump up five spots from a week ago. The Wildcats benefitted tremendously from the return of SEC 60-meter hurdles champion Kendra Harrison and her collegiate-leading 7.92 in her first meet of the season that moved her to No. 6 on the all-time college performers list. Harrison and sprint-standout teammate Dezerea Bryant joined forces to move Kentucky’s 4×400 from No. 17 in the country to No. 4 for another huge boost. Last year’s national runner-up and narrow Big 12 team champion Texas dropped a spot to No. 5, just ahead of the team that nearly took down the Longhorns this weekend: No. 6 Kansas State. Defending national champion Oregon continued to slide in the rankings, falling two spots to No. 7. Also dropping were No. 8 Texas A&M and No. 9 Baylor, both down a spot. Rounding out the top 10 was Southern California, which improved two spots following its MPSF title. Making the biggest strides of the weekend was 2014 cross country national champion No. 11 Michigan State. The Spartans improved an impressive 17 positions behind the second-fastest DMR of the season, featuring fifth-ranked miler Leah O’Connor. The senior ran 4:32.29 in the open mile to win by nine seconds at the Big Ten Championships, but was even more impressive as the anchor of the DMR, splitting a reported 4:25 on the 1600-meter leg to chase down Michigan for the win. MSU got another top-five distance performance from No. 4 Rachele Schulist at 3000 meters, also in a rout of 15 seconds. Jumping six spots to check in just behind MSU at No. 12 was MSU – Mississippi State, that is. The Bulldogs benefitted from No. 3 hurdler Erica Bougard and No. 7 miler Rhianwedd Price. While Michigan State was the Big Ten team making the biggest splash in the national rankings, the Spartans did not win the conference meet (they finished tied for fifth with Nebraska). The conference title went to Ohio State, which rightfully moved up three positions to sit atop the Great Lakes Regional ranking to finish the season. Conference championships weekend did not produce any more new No. 1 teams in the final edition of the regional rankings. In winning the SEC title, 114-89, over No. 3 Arkansas, the No. 1 Florida Gators got a big boost by the return of Arman Hall into the fold. A two-time individual All-American indoors last year, the junior moved to No. 8 on the open 400 meters list. His performance was enough to boost UF up 5.56 points for a team total of 188.29. That improvement kept the Gators out of a virtual tie with No. 2 Oregon, which jumped up nearly 40 points behind its distance runners at the MPSF Championships. With a collegiate-leading 9:27.02 distance medley relay – the fifth-fastest all-conditions in collegiate history – and a fourth-ranked effort at 3000 meters by Jeramy Elkaim, the Ducks checked in this week at 182.90. The rest of the top five remained the same with only minor changes to their point totals: No. 3 Arkansas (124.95 points), No. 4 Texas A&M (116.42) and Big 12 Champ No. 5 Texas (86.74). In fact, the only move among the top 12 teams was a trade at the No.7 and No. 8 spots with Georgia moving ahead of LSU. From No. 13 through No. 25, however, only one team remained stationary (No. 18 Baylor). The biggest beneficiary of the conference championship weekend was No. 21 Arizona State. The Sun Devils moved up a whopping 50 spots thanks to defending outdoor high jump national champion Bryan McBride hitting his stride indoors to move to No. 4 nationally while also taking the No. 10 spot in long jump. Also making significant moves were No. 16 Illinois (up 15 spots), No. 13 Nebraska (up nine spots) and two-time defending cross country national champion No. 22 Colorado (up six). There was only one change at the top of the final regional rankings of the season, as Michigan took over at No. 1 in the Great Lakes from MAC champion Akron.